The overall chart configuration type grants an immediate clue as to the individual’s principle approach to life. The location of the 10 planets—Sun, Moon, Mercury, Venus, Mars, Jupiter, Saturn, Uranus, Neptune, & Pluto—creates the chart type. Since your natal chart will include items not considered a planet, it is easier to determine the chart type if you copy the planet locations onto the empty chart below. 1. Number the houses on the empty chart below. 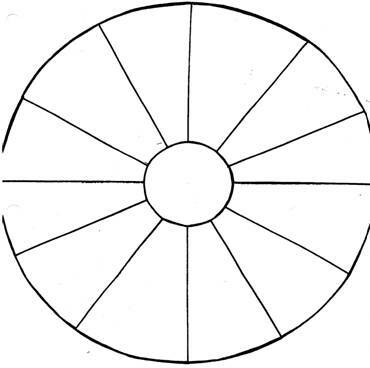 It is best to place the numbers next to the middle circle (as they are on your natal chart). 2. 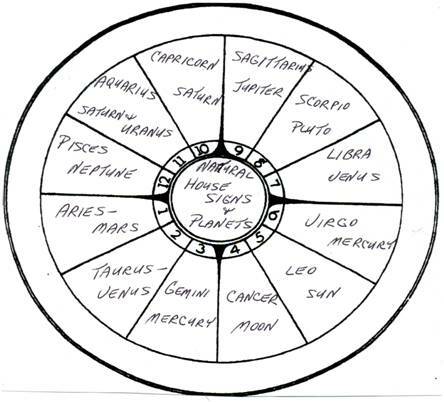 Using your natal chart, carefully copy the planet symbols into the houses on your work chart, being sure to place them in the same houses as they are found on your natal chart. Place the planet symbols just inside the house, as that will make it easier to determine the chart type. 3. Study the Examples of the Chart Configuration Types above … compare them with yours … and determine which type you are. The configurations will not always be clear cut … you will have to use your intuition and follow the type description as closely as possible. 4. Check for intercepted zodiac signs—see information below on INTERCEPTED SIGNS. Configuration: Planets are usually in 10 or more zodiac signs, scattered throughout the chart. Additional Information: The Splash type signifies one who incarnated to make a difference in life. This person usually stands out as one who is very versatile. Configuration: Planets located in 5 consecutive zodiac signs; they are “bundled” within 5 consecutive houses or within a 120 degree span. A fairly rare configuration. Interpretation: “These individuals find that life is held to certain narrow opportunities. They are generally inhibited in comparison to someone with the splash-type chart.” The person is likely to become a specialist—studying one subject in great depth. Configuration: Planets are located in 8-9 zodiac signs and the space of 240 degrees (two trines), leaving one 120 degree space (one trine) empty. Additional Information: The Leading Planet is the one leading the other 9 planets in a counterclockwise flow around the chart. Be sure to mark and study your Leading Planet if you are a Locomotive Type. Configuration: Planets appear in 6 consecutive zodiac signs. 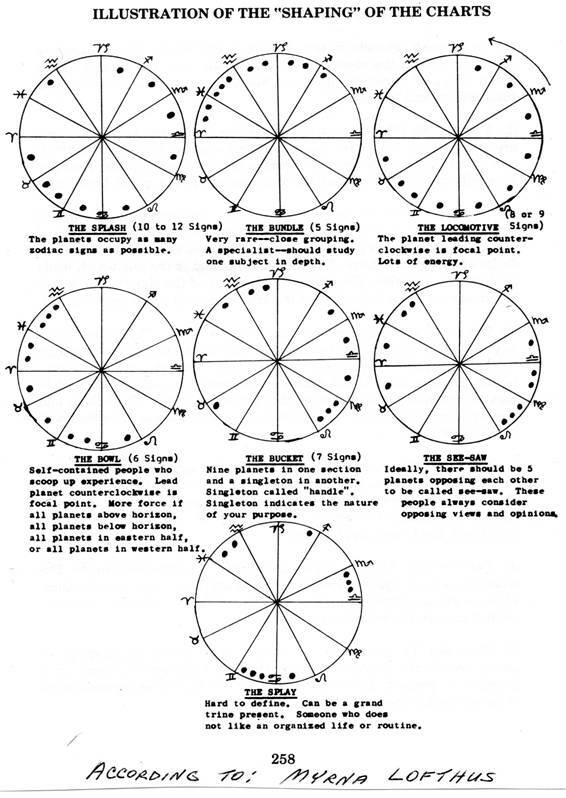 The planets lie in any ½ of the chart or within a 180 degree space. Interpretation: “If the division is along the horizon or meridian line, a hemisphere emphasis is created and power is granted to the person. These individuals are self-contained, because they find it difficult to express themselves. Thus, they seek to assimilate information so they can teach others. The houses and signs occupied are an indication of the areas and qualities they will instinctively work on.” Leading Planet Counterclockwise is the focal point. Additional Information: The sample chart in this course’s Introduction is a good example of the Bowl Type—that Bowl is within 4 degrees of being a perfect 180 degrees Bowl Type (from the Sun on 20 Gemini in the 1st house to Jupiter on 24 Sagittarius in the 7th house). In the sample chart, the Leading Planet is Jupiter in the 7th house because it is leading the Bowl Type planets in a counterclockwise flow. Be sure to mark your Leading Planet if you are a Bowl Type. The Leading Planet is an important one to study. 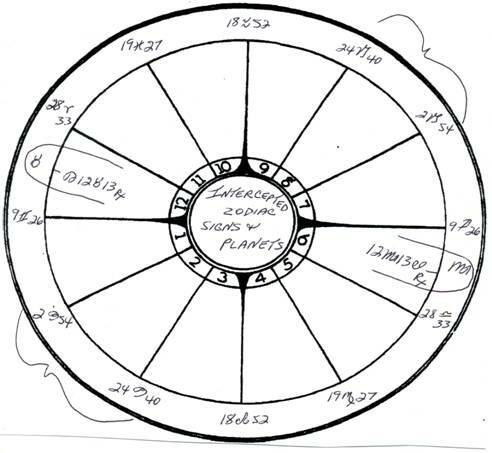 Configuration: 9 Planets will be in 6 consecutive zodiac signs in one section of the chart with 1 singleton planet in the opposite section, called the Handle of the Bucket. Additional Information: Be sure to mark your Singleton Planet if you are a Bucket Type. Configuration: The planets lie in roughly two opposing groups—ideally in groups of 5 planets each. The Splay can be hard to define. Refer to the Sample chart in the 3rd house – there is a Stellum in Leo—Moon, Pluto, and Saturn are within a span of 6 degrees in Leo. This is a perfect Stellum—yours may not be so closely conjunct. If you have a Grand Trine in your natal chart, it will look like this. 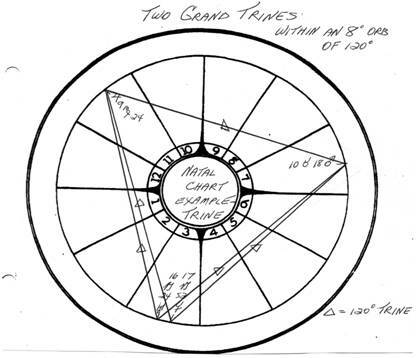 The one above is actually two Grand Trines. Note that the distance from Uranus in the 3rd house on the 16th degree of Capricorn is approximately 120 degrees (within the orb allowed for a Trine of 8 degrees) from Jupiter in the 11th house on the 9th degree of Virgo. The same is true of Mars in the 7th house on the 10th degree of Taurus. The above example is a Grand Trine in Earth Element and indicates that the individual is innately practical. Knowing the overall Chart Configuration/Shape Type amounts to having a general outline of the person. For example: A Splash person will usually stand out in a crowd—they intend to make a difference. For example: A Bundle person will appear introverted and appear to lack versatility in the choices he/she makes about life. As you prepared your Overall Chart Configuration, you may have noticed two house cusps on one side of your chart having the same zodiac sign – AND – two house cusps on the opposite side having the same zodiac sign. This is an indication of intercepted zodiac signs and the planets located in those signs. Refer to the Sample Natal Chart. Note that in the band around the chart, the zodiac sign for Scorpio is located in the center of the 6th house and the zodiac sign for Taurus is located in the center of the 12th house. This means that Taurus and Scorpio energies have no home cusp—they are intercepted. Check to determine whether or not your chart contains intercepted zodiac signs. If you have intercepted signs, check to see if you have planets in those intercepted signs. If so, encase the planets as illustrated below. Intercepted signs and planets have difficulty expressing freely. The bracketed zodiac signs will exert more influence in your life expression. Intercepted sign energies have no house cusp through which to easily express. Intercepted signs always occur in pairs. For example: If Virgo is intercepted, its polar opposite, Pisces, will also be intercepted. This causes another set of zodiac sign polarities to rule two house cusps apiece, granting those energies added influence in your life. Intercepted signs indicate where we neglected to grow and expand in former life times. They indicate serious neglect on our part over the span of several lifetimes, so in this lifetime our souls are anxious to develop and incorporate the positive sign characteristics into our life expression. In order to ensure that we do so, the intercepted sign energies create obstacles and problems in our lives until we learn to use the energies constructively. Remember: A problem exists ONLY as long as it takes for you to learn the lessons involved and cease repeating the behavior. Intercepted signs indicate circumstances which appear beyond our control because they are circumstances we neglected in prior lifetimes. These circumstances must be attended to in this lifetime, if we are to achieve wholeness. In order to find the circumstances you neglected, look to the description of the zodiac sign intercepted. Read the positive characteristics and intuit the areas you have neglected. For example: Virgo Intercepted – Virgo is the natural ruler of the 6th house of service & health. So the house in which Virgo is intercepted in your natal chart indicates where we neglected to serve in prior lifetimes. As a result, people will seem to call upon us repeatedly for help and seeking our advice. We will feel that we have no control over this. Pisces is Virgo’s polarity and will also be intercepted. Pisces is the natural ruler of the 12th house, where we learn compassion and understanding for others, get to know our subconscious self, and strive to become a spiritualized being. Therefore, the house in your natal chart in which Pisces is intercepted will indicate where you failed to develop compassion, where you neglected to attune to your subconscious attitudes regarding the area of life the house involves, where you omitted a spiritualized approach to life. Intercepted signs will naturally express according to the negative characteristics of those zodiac signs because we have neglected to develop the positive characteristics. The soul’s goal is to transmute the negative and to develop the positive characteristics. The negative expressions of intercepted signs and the problems they cause are to act as the stimuli to compel us to grow into wholeness. They are never meant to defeat us for yet another lifetime. Bringing out the positive characteristics of intercepted signs can mean harder work, but developing them is required before we can attain wholeness. REMINDER: We are never allowed to include more in our Soul’s Contract for this incarnation than we can successfully accomplish. Your Soul is guiding you on the Path. The zodiac sign on each house cusp of your natal chart reveals the lesson your Soul desires to learn within the area of life’s experiences indicated by the particular house. You will experience a sense of personal wholeness and fulfillment as you learn each of the lessons. The house cusp on which you find ARIES – indicates the area of life in which you need to be independent. The house cusp on which you find TAURUS – indicates the area of life in which you need: 1) to develop your sense of values, 2) where you may tend to be locked into the world of matter, and 3) where you need to be productive in a realm beyond the material world. The house cusp on which you find GEMINI – reveals where you need to obtain a variety of experiences, to be curious and investigate. The house cusp on which you find CANCER: reveals where you need to “nurture” your growth and development. The Cancer-ruled house indicates the area of life in which your Sun Sign innately expresses itself the most. The house cusp on which you find LEO – indicates where you need to focus consciously your Sun Sign energy and positive traits. This house has not received enough attention in previous lifetimes. Thus the positive qualities of your Sun Sign should be used to fulfill the karmic obligations owed to this house affairs. The house cusp on which you find VIRGO – indicates where you need to analyze your attitudes/ideas regarding the house affairs. Past life patterns and concepts need re-thinking. 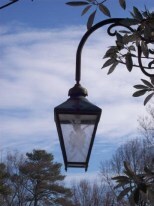 The house cusp on which you find LIBRA – reveals where you have been out-of-balance in prior lifetimes. The scales have been tipped too far to one extreme and must now be balanced. This is the house where you “reap what you sowed” in prior lifetimes. You see your former traits/attitudes being mirrored back to you by those in your environment. The house cusp on which you find SCORPIO – indicates the area of life in which you need “deep involvement.” You should be intensely concerned with the affairs of this house. The house cusp on which you find SAGITTARIUS – reveals where you need to “expand” your knowledge and review your attitudes toward the house affairs. This area of life has been restricted in prior lifetimes, either through choice or circumstances. The house cusp on which you find CAPRICORN – reveals where you must make “restitution.” There is a need to re-think your ideas about this house’s affairs. In prior lifetimes, you sought personal recognition through the affairs of this house. Now, this house will be one of frustrations until you no longer seek personal recognition. Then, you may receive personal recognition, but only as the proper attitude is restored. The house cusp on which you find AQUARIUS – indicates where you need to reform old ideas and concepts about the house affairs. New concepts can be used to break down old concepts from prior lifetimes. You may experience abrupt changes while this reform takes place. The changes can be constructive or destructive, depending on whether or not you are aligning with your Soul’s purpose. The house cusp on which you find PISCES – indicates the house affairs in which you need to use your intuition. There will be no guidelines to help you; therefore, you will have to believe in your hunches. Everything will appear to be confusing or misleading. “Faith” will be necessary in this house’s affairs—faith in yourself and in divine order.